My long-suffering Keyboard Kindle finally shuffled off its mortal coil. I hopped on Amazon.com immediately to buy a new one, because I just can’t be without my precious $2.99 ebooks. The cheapest model available comes with advertisements: there’s a smallish banner on the home page, and when you turn the device off, the screen shows an advertisement rather than a random picture of an author/coffee cup/generally book-related thing. 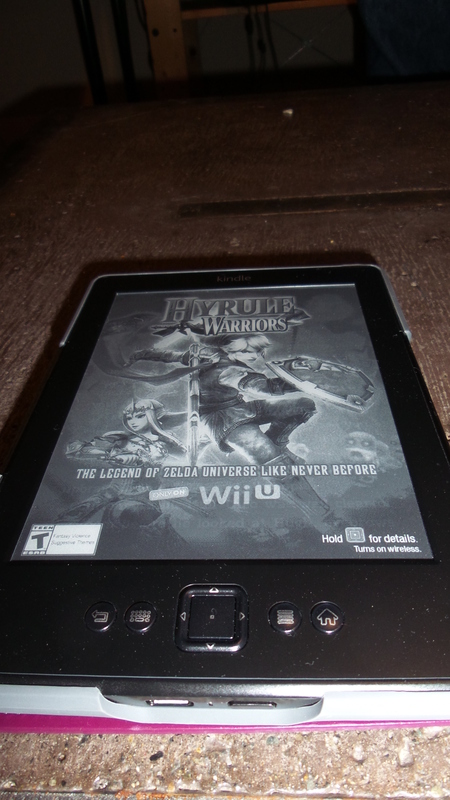 Here is a picture of my Kindle trying to convince me to buy a game exclusively for a device that is not a Kindle. I don’t own a Wii U, I don’t buy video games from Amazon, and I only recognize the characters from Legend of Zelda because I played Super Smash Bros at a friend’s house eight years ago. This is the opposite of targeted advertising. I actually do like Amazon’s recommendation engine, even when it’s a creepy reminder of just how much the company knows about your purchasing habits. It’s tailored to your interests, it’s difficult to game, and it isn’t (as far as I’m aware) weighted in favor of the Big Five. I’ve discovered plenty of excellent authors through that service. So I’m annoyed that my Kindle’s advertising runs on a different, far dumber system, one that keeps insisting I would like to read inspirational memoirs and police procedural thrillers. My boyfriend had a different issue with the Kindle. He was bothered that a device I had bought to read books on had advertising on it at all. I had bought it, I owned it, so why should I be subjected to advertising at all? That’s a trickier issue. On the one hand, what consumers are allowed to do with their own devices is a legal grey area; if I decided I didn’t want to see these infuriatingly off-beat ads, I might be able to find a way to block them, but I would certainly void my warranty at the very least. On the other hand, books and advertisements used to mix perfectly well. Modern readers reacted with horror when the Wall Street Journal floated the idea of ads in books, even though the practice was common only thirty years ago in print books. In the comics industry, back-of-the-book advertisements are remembered with great fondness. When I buy a print magazine or a newspaper, I expect ads on almost every page. What makes books the exception? There seems to be a cultural assumption that prose, especially prose fiction, should exist in a vacuum untainted by any whiff of merchandising. Books should just appear, perfectly edited and pleasantly bound, and the reader should find out about them through some sort of spontaneous inspiration. The advent of online bookstores, and ebooks in particular, has heightened this fear that our books are somehow in danger of being corrupted by crass commercialism. Never mind that bookstores have been selling choice display space for ages. Never mind that publishers have advertised books for generations (in fact, a publishing company that didn’t advertise its products would not be long for this world). So I’m mad about these ads, but not because I object to the concept of ads in my books. I’m mad that Amazon is clearly taking publishing companies’ money to put ads in front of the wrong people, using a system that’s way worse than what they already have available for free. Reblogged this on Lovetiggi's Book Reviews and Promotions. Astra Nullius is a collection of free science fiction stories following the crew of the starship Benevolence. While it’s technically a piece of serial fiction with events unfolding in chronological order, each story stands alone as an episode, so you can start reading anywhere in the series.